Not long after the march across the bridge had stretched about 200-strong as chants of “How Strong-Flagler Strong” rang out above the Intracoastal, not long after the marchers—students, faculty, administrators, parents, politicians—walked around the largest First Friday crowd to fill Veterans Park in Flagler Beach since July 4, and soon after the band played Santana’s “Oye Como Va.” Tyler Perry, a junior at Flagler Palm Coast High School, took the stage, thanked the organizers of the event for letting him speak, and spoke. As he spoke, students, most of them from Flagler Palm Coast High School, some from Matanzas High School, lined the front and sides of the stage, two or three students deep, standing ramrod and holding up signs: “We cannot protect our guns before we protect our children.” “Enough is enough.” “No more silence end gun violence.” Perry wasn’t visible anymore, but he wasn’t there to be seen, just heard. 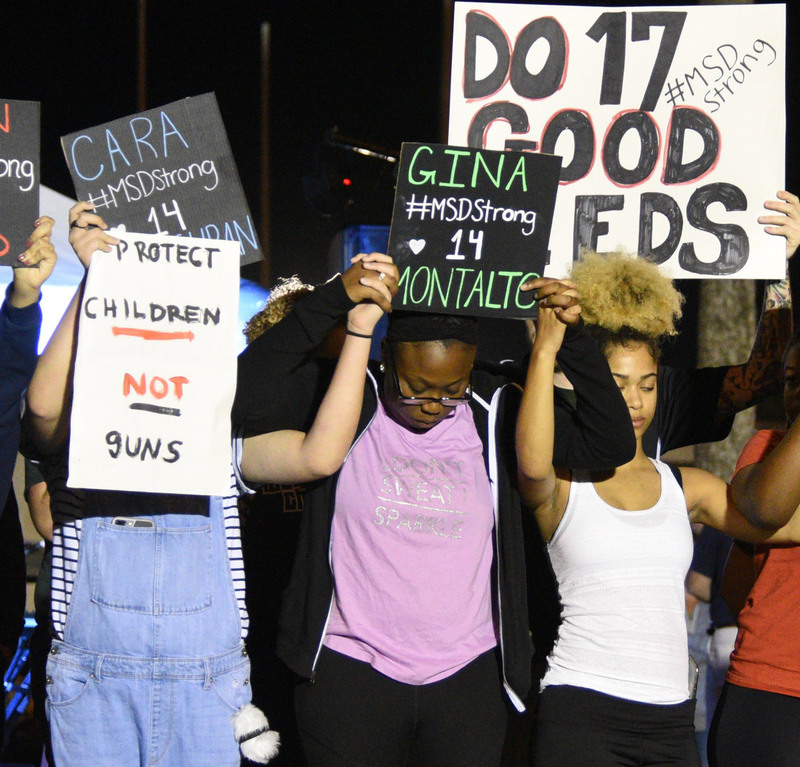 But it was when the students on stage lifted more uniformly sized signs, all of them black with red, green or white lettering, each naming one of the victims of the Parkland massacre, and when Perry slowly read out the names and ages of the victims, that the gravity of the moment silenced the crowd and provoked tears: Alyssa Alhadeff, 14. Scott Beigel, 35. Martin Anguiano, 14. Nicholas Dworet, 17. Aaron Feis, 37. Jaime Guttenberg, 14. Chris Hixon, 49. Luke Hoyer, 15. Cara Loughran, 14. Gina Montalto, 14. Joaquin Oliver, 17. Alaina Petty, 14. Meadow Pollack, 18. Helena Ramsay, 17. Alex Schachter, 14. Carmen Schentrup, 16. Peter Wang, 15. It took just one minute to read the lives that collectively had added up to 334 years, and that had been stilled in a shooting rampage that lasted a few minutes. There was a moment of silence. Samantha Schumacher sang “God Bless America,” and some people rose from their beach chairs as she sang, then the band played “Born in the U.S.A.,” a somewhat discordant way to segue from the students’ message, which had nothing of the bombastic or prideful about it: just a plea to be heard and a pledge to be accountable. “We need to be the generation that puts an end to bullying, suicide and gun violence, because students united can never be divided,” Perry had said. The march he led had started as errant discussions with fellow students, then administrators and others about how to make a statement with an impact before the end of the legislative session, where lawmakers and the governor are at loggerheads over what sort of gun-safety and school-safety legislation to craft, if any. (Legislators are in session Saturday to try to reach a compromise.) Perry, president of FPC’s Student Government Association, devised the march with a few other members of the association, then got to work coordinating with officials and David Ayres, general manager of Flagler Broadcasting, one of whose radio stations sponsors the musical portion of First Friday. Culminating the march by taking the stage for a few minutes was the clincher: it wasn’t a protest but stand, and by the time Perry was about to go on, those responsible for keeping the peace—the likes of Undersheriff Jack Bisland and Flagler Beach Police Chief Matt Doughney—were asking to have their picture taken with Perry. 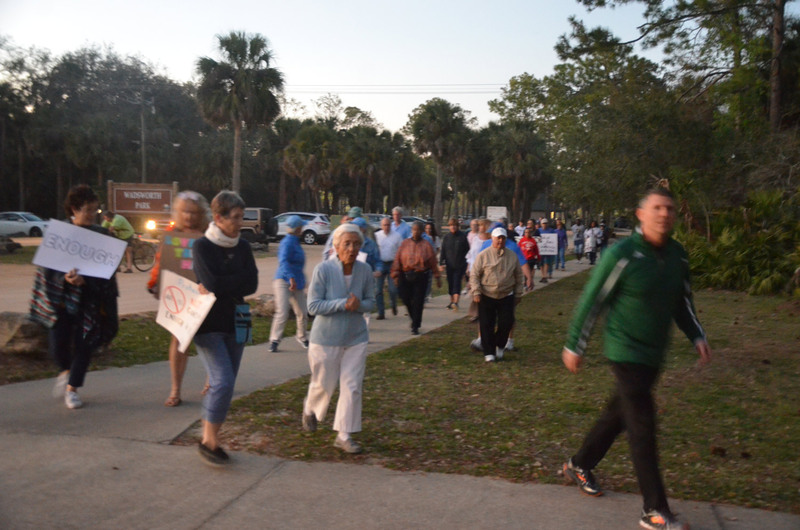 The marchers had gathered in the waning dusk at Wadsworth Park on the other side of the Flagler Beach bridge, starting a little before 6, first in handfuls, than by the dozen, then in a throng that included County Commissioners Dave Sullivan and Don O’Brien, School Board members Andy Dance and Colleen Conklin, Flagler Beach Commissioner-Elect Eric Cooley, the school district’s Lynette Shott (a former FPC principal, now in charge of the district’s community outreach), FPC Principal Dusty Sims and many other members of the faculty, including Shoshanah Mercado, the FPC school psychologist, who was walking alongside history teacher Steve Von Glahn (whose last retweet was “Be More Kind,” and who carried a sign one of his students had made: “Do 17 good deeds.”). On the bridge. Click on the image for larger view. “Even in the moment of intense fear and wondering: are we safe,” she continued, “they know that they are,” but they also want to take action. “They want to make change,” she said. “The idea of putting guns in their teachers’ hands is terrifying for a lot of them.” Perry said in an interview just before the march, when he was the center of attention, cameras clicking, a TV camera whirring, reporters interviewing him. Dusty Sims, his principal, who is usually at the center of all things FPC, stayed on the periphery, knowing this was his students’ moment. But his pride in his students was just as apparent, as it was in the way other officials saw the event. To O’Brien and Sullivan, the county commissioners, the students’ civic engagement was what they sought to celebrate and encourage. At one stretch during the march, near the midpoint atop the bridge, a man walking the other way, whose appearance and voice seemed equally grizzled by well over half a century, blurted out to the marchers in clear derision: “How many people got shot at at a gun show this week?” A couple of students instinctively were about to react. A faculty member quickly jumped in: “Hey hey, don’t give it back, give him love.” By then of course the man was long gone, his hurry having signaled as clearly as his derision that he was not interested in a conversation. That was about the extent of the sniping along the march’s brief route. 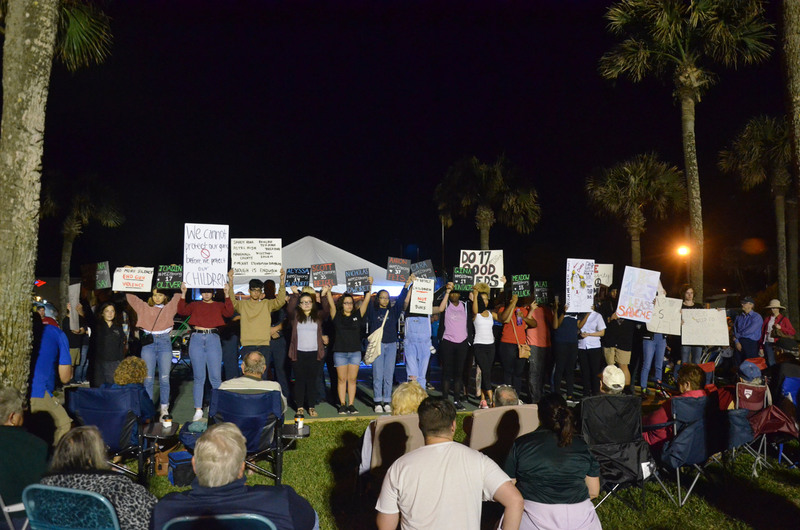 If any disrespectful words were spoken from the crowd at Veterans Park, they could not be heard even in the relative silence of the students’ seven-minute stand. Conklin, the school board member, had marched then watched it all from a spot not far from the stage, filming it with her phone. “Very well done. Very moving. Very meaningful,” she said when it was over. “It was very beautiful. They did good.” Just about then a full moon, spotless and crisp, was rising over the Atlantic, bright enough to add a little white light for those making their way back across the bridge to Wadsworth Park. 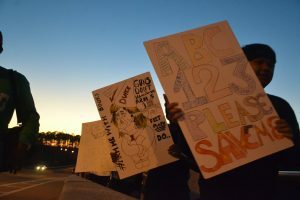 Thank you for a vivid article and photos, and thanks to the students for making a statement in a respectful manner. 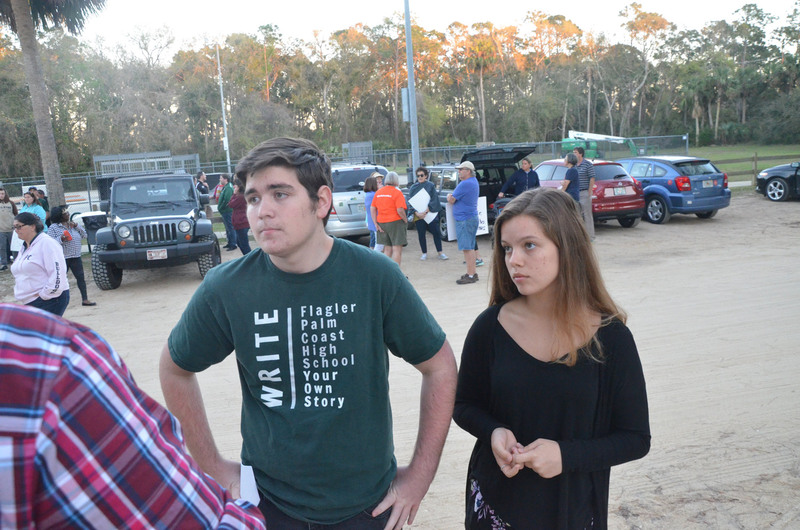 I hope they stay organized and attend Flagler School Board meetings. Those are the people with the power to do something. These children are an inspiration. Don’t tell me public education doesn’t work. Enough is enough. There are many common sense solutions to the gun violence problem in our nation. The Florida legislature is considering some that make great sense, but there are two that do not. First, arming our teachers will only increase the chances of more children and staff getting hurt. The second solution that they will NOT consider is banning the military style weapons that are sold in Florida. Another problem is that they are NOT putting enough money to put in action the solutions for our local schools. If we truly wish to protect our children, we must contact our Florida legislators and Governor and demand it ALL. It’s time for America to reject the NRepublicanA! The “kids” are leading now. We must catch up and stand with them. Vote NRepublicanA out! Superb in every way.. as a teacher I am rewarded to see that what teachers teach is well imbedded and clearly useful to those they teach. These students are learning through all the schools offer how to live meaningful lives. These students are supported( not led) it their mission. So proud. So meaningful. So strong. Tyler Perry seems like a fine young man. I am not sure exactly what he is suggesting in regard to firearms. I do agree with him on armed teachers. Not a good idea! The only advice I would give Tyler. You better think very carefully before you give up any of your constitutional rights. Forgive the errors. Stream of conscience. * Abolish the Second Amendment. “We need to be proactive. We need to work hard to foster deep and meaningful student-to-student connections so that no child feels socially isolated.” I can only hope that everyone in the school system lives up to this simple idea. Additional rules/laws that degrade our American values, such as the 2nd Amendment, will not solve anything. I am sure that bad people (criminals) will follows the new laws. Maybe we should enforce or tighten up the many laws we already have in-place first.Why punish law abiding citizens with additional burdens that will turn them into criminals? Maybe we should make it illegal for people to have property to stop burglars from stealing? Firearms are not the problem, people are. No one, not one person, has said that any teacher or other school worker will be forced to be armed. In addition to metal detectors and additional armed school police/resource officers, keyed entry and searches, (and additional hardening) schools can be made safer. I am sue there are many volunteers that are willing to help. As school entrance monitor/searchers, prenatal patrols, armed guards etc. to help protect our kids. We spend billions protecting everything else, why not billions to protect our kids? There is no simple single answer to this problem. I applaud the kids voices in forcing this issue to the forefront as it should be. I appreciate our leaders making this problem a priority and listening. I do not appreciate people using this issue as a stepping stone to push their single minded agenda attempting to subvert or degrade our values. Individual rights are the number ! value of our country. Those students should feel proud and worthwhile for what they are doing. Maybe more adults should take notice and participate. Never have I been made more aware than now how much our politicians put more importance on money and electability. than they do about the welfare of it’s citizens even if it means that innocent people will die because if it. Ban the sales of the ammunition that goes into these weapons like the AR-15 and that would render them useless and nobody could use them except for militiary. Government can ban the sales of other things so why not ban sales of certain kinds of ammo. I do not appreciate people using this issue as a stepping stone to push their single minded agenda attempting to subvert or degrade our values. Are you referring to the NRA???????? Isn’t this the same generation that eat tide pods, confused about which bathroom to use, doing copycat threats on social media. Oh yes! The ‘kids” are leading now. LOL We must catch up and stand with them now. Must be Democrats. BRAVO students. Keep it up. There is no reason for people to own assault weapons and military rifles. @God says She hates a liar – especially one with blood on its hands. The role of the NRepublicanA in this country’s bloody national nightmare is a matter of historical record. Keep up the good fight, students! You are a source of pride for your community! Don’t let the a**holes get you down. @gmath55…..Good one! The Tide pod eaters and internet generation rule the world….smh. Hey Nightwatch – Rather than bash the NRA tell us, would you support a 1% increase in the state sales tax to support securing our schools (SOS)? In November, 2017 the State of Florida collected $2,133,000,000 (over 2 billion dollars) in sales tax at a rate of 6%. Let’s say that equates to about $24 billion per year. Elementary school math tells us that’s $4 BILLION dollars for each one percent of the tax rate. So a 1% increase in the state sales tax would generate about $4 BILLION which when divided among the 67 school districts in Florida comes out to about $60 million dollars for each school district in the state per year. Would you, nightwatch, support a law that adds add 1% to the state sales tax for the next five years at which time the tax would “sunset”? That would provide about $300 MILLION dollars to EVERY school district in the state over the next five years to secure our schools. Would you agree to pay an extra penny in sales tax for every dollar you spend or will you just continue bashing those with whom you disagree? Are you a part of the solution or are you a part of the problem? Eh? Great article, even greater kids. Too bad some cannot resist the politics behind this. Do I think that high schoolers should be deciding Constitutional rights? No, I do not. But having them interested in the discussion is a good start. I’m so proud of you all and support all the hard work you are doing! Keep it up! You all are the future and you deserve better! I don’t think 200 voices is going to change 275 million people’s minds on such a basic principal as the 2nd amendment. Marchin’ across the Flagler Beach Bridge is a start. but these kids need to take it to Tallahassee and let their voices be heard in the Capitol Building. Ignore the haters. The good guys have got your back! TAKE OUT OF SCHOOLS JUDGEMENT WILL COME AND IT IS COMMING. Greetings all, from Simon’s Town, South Africa. So proud of those protesters! Our hope of sanity is in the future generations! While the Democrats are in favor of reasonable gun “safety” laws, nationwide. Passing gun safety laws on a state by state basis will do NOTHING to curb the murders of the innocent. . . guns are very easily transported across state lines. BAN ALL automatic and semi-automatic weapons of mass destruction and the ammunition AS WELL. We may not be able to retrieve the horrific weapons but the banning of all ammunition will render them useless. How about the violence of abortion? More babies die from abortions than gun violence. More kids die yearly from texting and driving. Isn’t that illegal? Making something illegal has not seemed to stop texting, or drug overdose, isn’t shooting someone already illegal? Instead of walking out of school, walk back in and make friends with the “loner”. Ribhoba…it is about “politics” and our Republican legislature IS the problem. They refuse to vote against the NRA and create some sensible regulations to limit the sale of deadly military-type semi-automatic weapons. They refuse to acknowledge the facts – these guns have no other purpose in life but to kill as many humans in as short of time as possible, and these weapons of war are the single common denominator in mass shootings. They ignore the wishes of the majority of Floridians and of Americans. They prefer to take the NRA’s blood money and let kids and teachers risk their lives every day in our schools. The NRepublicAn Party lies while kids die! I hope my children grow up to be as as smart, brave and passionate as these children. So proud and hopeful! 200 plus in a area of over 90,000, not a good showing! Good for you. Your parents should be proud. All credit to the young people leading their country out of its long blood soaked night. As you, i.e., young leaders, read these comments and snicker at the dust farting geezers who dis you, the trolls posting arguments that smell like the bar stool where they were born, and the repetitive posing of a loaded question https://en.wikipedia.org/wiki/Loaded_question – always remember first principles: Who profits from the way things are? Then follow the money. NRA honored Pai for killing net neutrality, tried to give him handmade long gun. The students did great!! Their parents and teachers should be proud of them. The one thing I took away from this is at the park everybody shut up and listened to what they had to say and applauded them. Tells me their message was well received. Of course the haters will always hate, some just aren’t happy unless they are unhappy. Ignore them. Bob…I am from Iowa…the most literate state in America. When I was in school, in the 50’s & 60’s, we did not pray in school. We prayed at home with our families — or in Church with our Church families. We read the Bible in small groups and tried not to take them out of context. These students, aka children, are trying to be taken seriously…we should respect that. PS…I used to hunt with my dad…and he didn’t need an automatic weapon to take down a deer or a pheasant! So proud of our kids good job! You students are amazing! What a great tribute. I am honored to watch this rising generation. Beat your drums and be done. I am so proud that these students are our future. @gmath55, thank you for showing us how stupid and ignorant people express their ideas. You have judged a whole generation on a few misguided stupid people. Should we judge all people in your age group as stupid and ignorant or only those who are actually stupid and ignorant? It is telling that subsequent to my posting here and on other stories on flaglerlive.com where I suggest we pay a SINGLE penny more in sales tax for every taxable item we purchase in Florida in an effort to secure our schools (S.O.S.) I have heard only crickets along with the occasional growl from some very old men that throw out the tired, lame comment, “HELL no – I don’t have any kids in school so why should I have to pay to protect school children from murderers?” That argument is not only disgusting to every reasonable human being, it is tantamount to saying, “I never call the police or fire department for help so why should I pay taxes that provide for those services?” Is this what our society has come to? Is the worth of a child’s life less than a penny? Telling, very telling and indicative of the self-inflicted misery of those who insist upon being a continuing part of the problem rather than a being part of the solution. Hey, Randy…I will gladly support a hike of the sales tax of at least 2% to not only improve school safety but to pay teachers what they’re really worth. Florida public school teachers are among the nation’s lowest paid. They spend their own money to buy supplies, And then our NRA-addled legislature proposes that they take on armed intruders. It is typical Republican insanity. So, let’s support a 2% tax sales tax increase for our public school system, put in the latest security equipment, ensure each school has an adequate number of resource officers. And then ban the sale of weapons of war. This will make our schools much safer. I just came across this. He is right on the money.